At university, your writing (including exams, essays, lab reports, etc.) demonstrates that you yourself have engaged in a process of learning. In the professional world, presentations of original work demonstrate your status as a scholar or expert. For that reason, in your writing you must always be clear about which words and ideas are yours, and which come from other sources. What if I didn't mean to cheat? 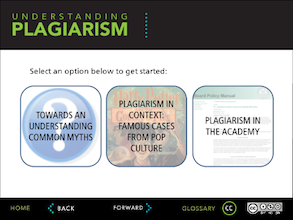 Even if you do not intend to cheat, it is still possible to plagiarize accidentally if you use sources incorrectly. It is perfectly fine to make use of the words and ideas of others (including friends, professors, written sources, etc.) as examples or evidence. However, you must make sure that any reader can distinguish your ideas and creations from the ideas and creations you have discovered in the source material of others. In your document (paper, essay, speech, etc. ), identify the presence of ideas/creations that you have taken from the source material of others, whether you directly quote, paraphrase, or summarize those ideas. Do this with words such as "according to…" or "as Dr. X said…" and in-text citations. In your reference list, provide a complete bibliographic citation for each source. You must take both steps. Listing a source only in your reference list is not adequate. To help your reader distinguish your original ideas and content from those created by others, you must show the origin of any word or ideas not your own immediately after their use in your document with an in-text citation. Expectations and standards for academic writing are not the same across the world, nor are they the same in all fields of study. Do not assume you can apply previously learned techniques. It is your responsibility to seek information and ask questions of your professors until you are sure you understand their expectations and the standards at Eastern Michigan University.